Published in the January 2005 edition of the Restoration Herald. Contact the Christian Restoration Association for subscription details. 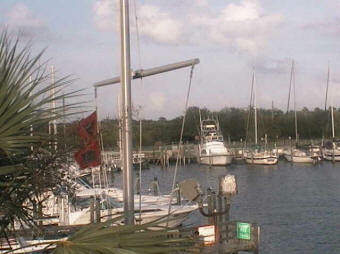 Recently on a visit to a marina webcam in Florida, my wife snapped a picture of the hurricane warning flags. Two red flags were being flown to warn the boaters of the storm about to hit. The storm ended up making landfall about 100 miles south and soon the hurricane flags were pulled down. If the storm would have hit, the visitors to this marina would have been warned the storm was coming. As I sit in my East-Central Illinois home and reflect on this, I am reminded that there are many red flags in this world that warn us of many different things. If we don’t heed the red flag warnings, we will have to face the consequences of the storms that may come. Of course as an evangelist, my mind quickly thinks about all the red warning flags we have in the church. For example, several years ago I remember sending a resume to a church and receiving a packet back from them. In the packet were red flags that warned me that this was not the church for me. The first red flag was the “Pastor Job Description” that was included. The whole time I was thinking they had an opening for an evangelist, not an elder. The second red flag was found in a bulletin they sent to me from a previous Sunday which announced “Reverend” so and so was going to be the guest speaker next week. I heeded the red flags and did not pursue the ministry in that particular church. These red flags are not simply for evangelists, but for everyone. Pastor or reverend used to refer to the evangelist. Seeing God always used words to speak to people in the Scriptures, this is a scary red flag. Does this mean that God is audibly speaking to people today? Interdenominational involvement in ways that promoted unity when doctrinally the churches were not even close. Baptism excluded from preaching and teaching. We believe we found a church where these and many other red flags were not present. Ask a prospective evangelist about the process he uses to prepare a sermon or lesson. 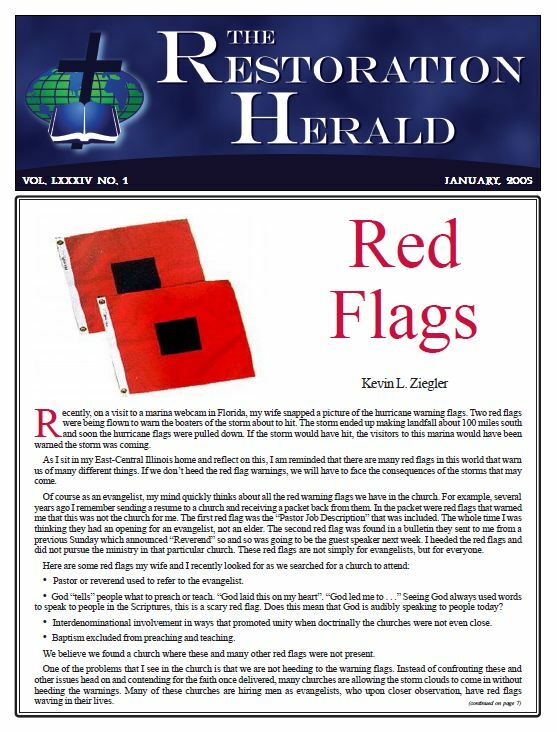 If he starts to talk about how God lays things on his heart or speaks to him, heed the red flag! Ask a prospective evangelist which title he prefers to be called. If he says reverend or pastor, heed the red flag! Ask a prospective evangelist about the purpose of baptism in salvation. If he is wishy-washy in anyway, heed the red flag! (An elder told me about one prospective evangelist who told him in the interview process that he would preach baptism in whatever way the church would like – a little too flexible for remaining true to the Word)! Ask a prospective evangelist his stance on denominationalism. If he is interdenominational, heed the red flag! Ask a prospective evangelist about his family life. If he and his family (if married) are not fully committed, heed the red flag! Ask a prospective evangelist about his character. If he acts as if he has things to hide, heed the red flag! Just as the hurricanes which hit Florida in 2004, were devastating, these issues and others can be very devastating to the church which does not heed to the warnings. I am afraid that if we continue on this path, within a generation or less, it will be hard to find a church that has heeded the warnings and remained steadfast. My wife and I have six children and we want the church to be as strong for them as it was for us as we were being molded in our faith. We admire the men and women who were courageous in our lives to protect us from these warning flags. Now we are attempting to do our part in watching for these red flags. Will you heed the warnings and contend for the faith with us? My wife Paula snapped the picture from the webcam at the City of Gulfport, FL, website.